The London Underground (also known as the Tube or simply the Underground) is a public rapid transit system serving a large part of Greater London and parts of the home counties of Buckinghamshire, Hertfordshire and Essex. The network is considered the oldest rapid transit system, incorporating the world's first underground railway, the Metropolitan Railway, which opened in 1863 and is now part of the Circle, Hammersmith & City and Metropolitan lines; and the first line to operate underground electric traction trains, the City & South London Railway in 1890, now part of the Northern line. The network has expanded to 11 lines, and in 2013/14 carried 1.265 billion passengers, making the Underground the world's 11th busiest metro system. The system serves 270 stations and has 402 kilometres (250 mi) of track. Within London, the Underground mostly serves parts other than the South: less than 10% of Tube stations lie to the south bank of the River Thames. Despite its name, only 45% of the system is actually 'underground' in tunnels. The system's first tunnels were built just below the surface using the cut and cover method, and are large enough to take trains of normal size. Later, smaller circular tunnels – which give rise to its nickname the Tube – were dug through the London Clay at a deeper level. The early lines were marketed as the UndergrounD in the early 20th century on maps and signs at central London stations. The private companies that owned and ran the railways were merged in 1933 to form the London Passenger Transport Board. The current operator, London Underground Limited (LUL), is a wholly owned subsidiary of Transport for London (TfL), the statutory corporation responsible for most elements of the transport network in Greater London. The term 'Tube' is nowadays often used both in official publicity and in general usage to embrace the whole Underground system, though it is sometimes only applied to the lines that run in deep-level tunnels, excluding the Circle, Metropolitan, District, and Hammersmith & City lines. As of 2015, 92% of operational expenditure is covered by passenger fares. The Travelcard ticket was introduced in 1983 and Oyster, a contactless ticketing system, in 2003. Contactless card payments were introduced in September 2014. The LPTB was a prominent patron of art and design, commissioning many new station buildings, posters and public artworks in a modernist style. The schematic Tube map, designed by Harry Beck in 1931, was voted a national design icon in 2006 and now includes other lines - the Docklands Light Railway, London Overground and TfL Rail - as well as the non-rail Emirates Air Line. London Underground branding is built around the symbols of the roundel and the Johnston typeface, created by Edward Johnston in 1916. London Underground celebrated 150 years of operations in 2013, with various events marking the milestone. The idea of an underground railway linking the City of London with some of the railway termini in its urban centre was proposed in the 1830s, and the Metropolitan Railway was granted permission to build such a line in 1854. The world's first underground railway, it opened in January 1863 between Paddington and Farringdon using gas-lit wooden carriages hauled by steam locomotives. It was hailed as a success, carrying 38,000 passengers on the opening day, and borrowing trains from other railways to supplement the service. The Metropolitan District Railway (commonly known as the District Railway) opened in December 1868 from South Kensington to Westminster as part of a plan for an underground 'inner circle' connecting London's main-line termini. The Metropolitan and District railways completed the Circle line in 1884, built using the cut and cover method. Both railways expanded, the District building five branches to the west reaching Ealing, Hounslow, Uxbridge, Richmond and Wimbledon and the Metropolitan eventually extended as far as Verney Junction in Buckinghamshire, more than 50 miles (80 km) from Baker Street and the centre of London. Artmonsky, Ruth (2012). Designing Women: Women Working in Advertising and Publicity from the 1920s to the 1960s (1st ed.). Artmonsky Arts. Brown, Joe (1 October 2012). London Railway Atlas (3rd ed.). Ian Allan Publishing. Cooke, B.W.C., ed. (September 1964). "The Why and the Wherefore: London Transport Board". Croome, D.; Jackson, A (1993). Rails Through The Clay — A History Of London's Tube Railways (2nd ed.). Capital Transport. Day, John R; Reed, John (2010) . The Story of London's Underground (11th ed.). Capital Transport. Day, John R.; Reed, John (2008) . The Story of London's Underground (10th ed.). Harrow: Capital Transport. Green, Oliver (1987). The London Underground — An illustrated history. Hardy, Brian (2002) . 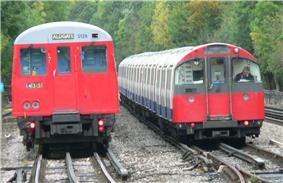 London Underground Rolling Stock (15th ed.). Harrow Weald: Capital Transport. Horne, Mike (2006). The District Line. Capital Transport. Lentin, Antony (2013). Banker, Traitor, Scapegoat, Spy? The Troublesome Case of Sir Edgar Speyer. Haus. Peacock, Thomas B. (1970). Great Western London Suburban Services. Oakwood Press. Rose, Douglas (December 2007) . The London Underground: A Diagrammatic History (8th ed.). Capital Transport. Simpson, Bill (2003). A History of the Metropolitan Railway. Vol 1. Lamplight Publications. Transport Committee (December 2009). "Too Close For Comfort: Passengers' experiences of the London Underground" (PDF). Transport Committee (September 2011). "The State of the Underground" (PDF). 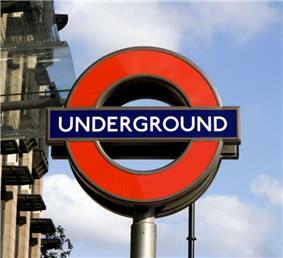 ^ a b c d e f g h "About TfL - What we do - London Underground - Facts & figures". Transport for London. Retrieved 17 June 2014. ^ a b c Transport for London, Windsor House, 42-50 Victoria Street, London SW1H 0TL, enquire@tfl.gov.uk. "Facts & figures". ^ "BBC News - Tube passenger numbers reach record high of 3.5m a day". BBC News. 28 May 2014. ^ a b c Telegraph (5 August 2015). "London Underground: 150 fascinating Tube facts". Telegraph. ^ Croome & Jackson (1993), Preface. ^ "In Living Memory, Series 11: The 1975 Moorgate tube disaster". ^ a b "About TfL - How we work - How we are governed - Subsidiary companies". Transport for London. Retrieved 17 June 2014. ^ "A brief history of the Underground - London Underground milestones". Transport for London. Retrieved 6 June 2014. ^ a b "Contactless payment continues to grow in London". BBC News. 17 March 2015. ^ "About TfL - What we do - London Underground". Transport for London. Retrieved 4 June 2014. ^ Martin, Andrew (26 April 2012). Underground, Overground: A Passenger's History of the Tube. London: Profile Books. pp. 137–138. ^ London Underground. "Corporate identity—colour standards". Transport for London. Retrieved 22 December 2007. ^ "Performance data almanac". Transport for London. 2014. ^ a b c "Commissioner’s Report" (PDF). Transport for London. 26 March 2014. pp. 3–4. Retrieved 2 April 2014. ^ Railway Track Diagrams Vol. 5 (2nd ed.). Quail Map Company. 2002. ^ a b c d e f g h i j k l m n Brown (2012). ^ Maund, Richard (2013). Passenger Train Services over Unusual Lines. ^ "Rolling Stock Data Sheet" (PDF). Transport for London. March 2007. Archived from the original (PDF) on 4 October 2013. ^ a b Connor, Piers (January 2013). "Deep tube transformation". ^ a b "Making transport more accessible to all". ^ "'"London's Tube 'unfit for animals. The Daily Telegraph (London). 28 August 2002. Retrieved 31 March 2013. ^ Croxford, Ben (4 December 2003). "Environmental Quality in Underground Railways". University College London. Retrieved 5 November 2013. ^ "Incline lift at Greenford Tube station is UK first". Transport for London. 20 October 2015. ^ "Step-free access". Transport for London. n.d. Archived from the original on 2 April 2013. 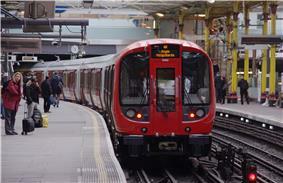 ^ "Virgin Media extends free wi-fi on London Underground until 2013". Metro (London). 17 October 2012. Retrieved 10 November 2012. ^ Lei W (24 December 2013). "Tube Relax (London):Have you ever missed your tube stops?". Google Play (London). Retrieved 4 January 2014. ^ Mulholland, Hélène (1 April 2011). 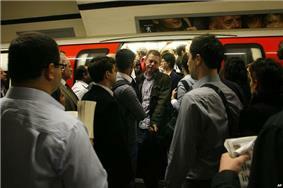 "Plans for mobile network on London underground shelved". The Guardian (London). Retrieved 1 April 2013. ^ "Three inTouch". Retrieved 17 October 2014. ^ "Crossrail 2: Supporting London's growth" (PDF). London First. February 2013. Retrieved 10 March 2013. ^ "Croxley Rail Link". Mouchel. March 2015. ^ Murphy, Joe (5 December 2012). "Boost for Battersea as Osborne puts power station on the Tube". London Evening Standard. Retrieved 19 January 2013. ^ Rhys, Paul (10 February 2006). "'"Tube line 'may extend south within 20 years. ICSouthLondon. Archived from the original on 11 April 2006. Retrieved 1 October 2009. 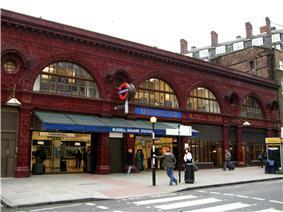 ^ "CamberwellOnline Blog » Camberwell Tube Station in 2026?". Camberwellonline.co.uk. 11 February 2006. Retrieved 1 December 2013. ^ "Scenario Testing for the Further Alterations to the London Plan" (PDF). ^ "London’s Forgotten Railway - The Transport Committee’s review of the North London Railway". Greater London Authority. March 2006. Retrieved 12 June 2015. ^ Coombs, Dan (17 June 2011). "Extending Central line to Uxbridge will cut traffic". Uxbridge Gazette. Retrieved 15 July 2011. ^ "Central line timetable" (PDF). TfL. Retrieved 25 June 2015. ^ "Information on the Northern Line upgrade" (PDF). railway-technical. Retrieved 25 June 2015. ^ a b "New Tube for London Programme". BBC News. 9 October 2014. Retrieved 9 October 2014. ^ "New Tube for London ITT delayed until December 2015". ^ "Where to Use Apple Pay". Apple. Retrieved 15 June 2015. ^ "Where can I buy my ticket?" (PDF). Transport for London. January 2012. Retrieved 18 June 2014. ^ "Fares & payments - Fares - Tube, DLR and London Overground". Transport for London. Retrieved 18 June 2014. ^ "Fares & payments - Ticket types". Transport for London. Retrieved 18 June 2014. 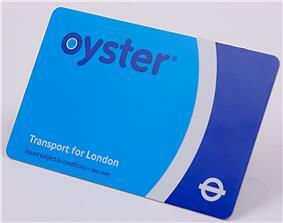 ^ "'"Travelcards make way for 'oyster. BBC News. 30 June 2003. Retrieved 7 March 2012. ^ "Getting around with Oyster" (PDF). Transport for London. January 2010. Archived from the original (PDF) on 26 September 2012. ^ "Fares & payments - Oyster - Using your Oyster card - Capping". Transport for London. Retrieved 18 June 2014. ^ "Fares & payments - Oyster - Using your Oyster card - Incomplete journeys". Transport for London. Retrieved 18 June 2014. ^ "Freedom Pass age change" (PDF). London Councils. November 2011. Retrieved 30 March 2013. ^ "Freedom Pass Map" (PDF). London Councils. December 2012. Retrieved 30 March 2013. ^ "Freedom passes – Hammersmith & Fulham". London Borough of Hammersmith & Fulham. 17 November 2010. Retrieved 4 February 2011. ^ "Revenue Enforcement and Prosecutions Policy" (PDF). Transport for London. 1 November 2012. Archived from the original on 30 March 2014. Retrieved 27 March 2014. ^ "Tickets: Fines and Penalties". Transport for London. Archived from the original on 14 March 2013. ^ a b "Transport in London over Christmas and New Year's Eve". Time Out London. Retrieved 1 April 2013. ^ Topham, Gwyn (21 November 2013). "London tube to run all night at weekends but 750 jobs to go". The Guardian (London). Retrieved 21 November 2013. ^ "Transport accessibility - Wheelchair access & avoiding stairs". Transport for London. Retrieved 18 June 2014. ^ TfL (2012), p. 9. ^ "Fares & payments - Replacements & refunds - Charter refunds". Transport for London. Retrieved 18 June 2014. ^ Booth, Nick (11 August 2011). "Apps that help you get money back on Delays". City AM (London). Retrieved 2 April 2013. ^ "Safety Authorisaton" (PDF). Office of Rail Regulation. 9 February 2012. Retrieved 19 April 2013. ^ "Quarterly Health, Safety and Environment Performance Reports – Quarter 3, 2012/13" (PDF). Transport for London: Safety and Sustainability Panel. 19 March 2013. Archived from the original (PDF) on 27 March 2014. Retrieved 19 April 2013. ^ "Quarterly Health, Safety and Environment Performance Reports - Quarter 4, 2011/12" (PDF). Transport for London: Safety and Sustainability Panel. 10 July 2012. Archived from the original (PDF) on 17 August 2012. Retrieved 19 April 2013. ^ "Tube suicides rise 74% over last 10 years". Metro (London). 10 November 2011. Retrieved 19 April 2013. ^ Coats, T.J.; Walter, D. P. (9 October 1999). "Effect of station design on death in the London Underground: observational study". ^ Brown, Matt (9 January 2013). "London underground's 150th birthday celebrated in Google doodle". The Guardian (London). Retrieved 9 January 2013. ^ "Google Doodle Marks 150 Years Of The London Underground". ^ "History of the roundel". ^ "Interchange signs standard" (PDF). Sections 3–7: Transport for London. January 2009. Archived from the original (PDF) on 21 August 2012. ^ "Heritage Library: Underground: Line". Urban Design. Transport for London. n.d. Retrieved 15 May 2013. ^ "Underground Journeys: Charles Holden's designs for London Transport" (PDF). V&A RIBA architecture partnership. n.d. Retrieved 15 April 2013. ^ a b c d e f "London Transport Posters: Frank Pick’s vision". Exploring 20th century London. Retrieved 21 April 2013. ^ "Poems on the Underground". Transport for London. Retrieved 19 June 2014. ^ Elizabeth Knowles, ed. (2006). "Mornington Crescent". A Dictionary of Phrase and Fable. James Henry Greathead (1844–1896) was the engineer that dug the Tower Subway using a method using a wrought iron shield patented by Peter W. Barlow, and later used the same tunnelling shield to build the deep-tube London & South London and Central London railways. images.surrealist and cubist and Kauffer's later abstract Charles Burton and over 1000 works were commissioned in the 1930s, such as the cartoon images of  By the time London Transport was formed in 1933 the UERL was considered a patron of the arts guide that promoted the country it served for the walker, visitor and later the house-hunter.Metro-land The Met, strongly independent, used images on timetables and on the cover of its  The Johnston Sans letter form began appearing on posters from 1917. to design posters for London Underground, London Transport and London County Council Tramways.Christian Barman. According to Ruth Artmonsky, over 150 women artists were commissioned by Pick and latterly Doris Zinkeisen and Anna and the sisters Charles Sharland ,Graham Sutherland ,Herry (Heather) Perry  Pick found he was limited by the commercial artists the printers used, and so commissioned work from artists and designers such as  and from 1908 the underground group, under Pick's direction, used images of country scenes, shopping and major events on posters to encourage use of the tube. 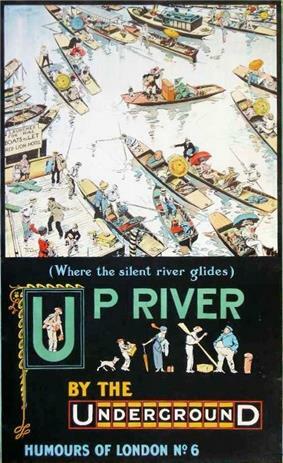 The Central London Railway used colour illustrations in their 1905 poster, and it became possible to print colour images economically in the early 20th century. Graphic posters first appeared in the 1890s, Early advertising posters proclaimed the advantages of travelling using various letter forms. The first posters used a number of type fonts, as was contemporary practice, and station signs used sans serif block capitals. The Johnston typeface was developed in upper and lower case in 1916, and a complete set of blocks, marked Johnston Sans, was made by the printers the following year. A bold version of the capitals was developed by Johnston in 1929. The Met changed to a serif letterform for its signs in the 1920s, used on the stations rebuilt by Clark. However, Johnston was adopted systemwide after the formation the LPTB in 1933 and the LT wordmark was applied to locomotives and carriages. Johnston was redesigned, becoming New Johnston, for photo-typesetting in the early 1980s when Elichi Kono designed a range that included Light, Medium and Bold, each with its italic version. The typesetters P22 developed today's electronic version, sometimes called TfL Johnston, in 1997. The current standard tube map shows the Docklands Light Railway, London Overground Emirates Air Line, and the London Underground; a more detailed map covering a larger area, published by National Rail and Transport for London, includes London Tramlink and suburban railway services. The tube map came second in a BBC and London Transport Museum poll asking for a favourite UK design icon of the 20th century and the underground's 150th anniversary was celebrated by a Google Doodle on the search engine. London Underground is authorised to operate trains by the Office of Rail Regulation, and the latest Safety Certification and Safety Authorisation is valid until 2017. On 19 March 2013 there had been 310 days since the last major incident, when a passenger had died after falling on the track. Accessibility by people with limited mobility was not considered when most of the system was built, and before 1993 fire regulations prohibited wheelchairs on the underground. The stations on the Jubilee Line Extension, opened in 1999, were designed for accessibility, but retrofitting accessibility features to the older stations is a major investment that is planned to take over twenty years. A 2010 London Assembly Report concluded that over ten per cent of the people of London had reduced mobility and, with an ageing population, numbers will increase in the future. No services will operate on the other lines. When the upgrade of the Circle, Hammersmith & City, District and Metropolitan lines is complete and the new signalling system has been fully introduced, along with new trains, the Night Tube service will be extended to these lines. 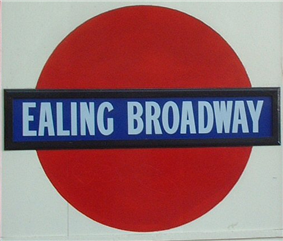 Central line: between Ealing Broadway and Hainault via Newbury Park/Loughton. No service between North Acton and West Ruislip, between Woodford and Hainault via Grange Hill, and between Loughton and Epping. Northern line: between Morden and Edgware/High Barnet via Charing Cross. No service between Kennington and Camden Town via Bank and between Finchley Central and Mill Hill East. Piccadilly line: between Cockfosters and Heathrow Terminal 5. No service between Hatton Cross and Heathrow Terminals 1, 2, 3 via Terminal 4 and between Acton Town and Uxbridge. Jubilee line: Full line - Stratford to Stanmore. Victoria line: Full line - Wathamstow Central to Brixton. The Underground runs limited service on Christmas Eve with some lines closing early, and does not operate on Christmas Day. Since 2010 a dispute between London Underground and trade unions over holiday pay has resulted in a limited service on Boxing Day. The tube closes overnight, the first trains running from about 05:00 to just after 01:00 the following morning, with later starting times at weekends. The nightly closures are used for maintenance, but some lines stay open at New Year's Eve and serve longer hours during major public events such as the 2012 London Olympics. Some lines are closed for scheduled engineering work at weekends to update the system. 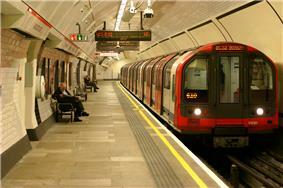 The Underground uses Transport for London's zonal fare system to calculate fares. There are nine zones, zone 1 being the central zone, which includes the loop of the Circle line with a few stations to the south of River Thames. The only London Underground stations in Zones 7 to 9 are on the Metropolitan line beyond Moor Park, outside Greater London. Some stations are in two zones, and the cheapest fare applies. Paper tickets or the contactless Oyster card can be used for travel. Apple Inc. are also bringing Apple Pay into the Transport for London network when released in the UK later this year. Single and return tickets are available in either format, but Travelcards (season tickets) for longer than a day are available only on Oyster cards. The project is estimated to cost £16.42 billon (£9.86 bn at 2013 prices). A notice was published on 28 February 2014 in the Official Journal of the European Union asking for expressions of interest in building the trains. On 9 October 2014 TFL published a shortlist of those (Alstom, Siemens, Hitachi, CAF and Bombardier) who had expressed an interest in supplying 250 trains for between £1.0 billion and £2.5 billion, and on the same day opened an exhibition with a design by PriestmanGoode. The fully automated trains may be able to run without drivers, but the ASLEF and RMT trade unions that represent the drivers strongly oppose this, saying it would affect safety. The Invitation to Tender for the trains is expected in December 2015, the specifications for the Piccadilly line infrastructure in 2016, and the first train to run on the Piccadilly line in 2022. Central line – The Central line was the first line to be modernized in the 1990s, with 85 new 1992-stock trains and a new automatic signalling system installed to allow Automatic Train Operation. The line runs 34 trains per hour for half an hour in the morning peak but is unable to operate more frequently due to a lack of additional trains. The 85 existing 1992-stock trains are the most unreliable on the London Underground as they are equipped with the first generation of solid state direct current thyristor control traction equipment. The trains often break down, have to be withdrawn from service at short notice and at times are not available when required, leading to gaps in service at peak times. Although relatively modern and well within their design life, the trains need work in the medium term to ensure the continued reliability of the traction control equipment and maintain fleet serviceability until renewal, which is expected between 2028–32. Major work is to be undertaken on the fleet to ensure their continued reliability with brakes, traction control systems, doors, automatic control systems being repaired or replaced among other components. The Central line will be part of the New Tube for London Project. This will replace the existing fleet with new air-cooled walkthrough trains and a new more up-to-date automatic signalling system. The line is predicted to run 36 trains per hour, a 25% increase compared to the present service of 34 trains for busiest 30 minutes in the morning and evening peaks and the 27–30 train per hour service for the rest of the peak. Northern line – The signalling system on the Northern line has also been replaced to increase capacity on the line by 20%, as the line now runs 24 trains per hour at peak times, compared to 20 previously. Capacity can be increased further if the operation of the Charing Cross and Bank branches are separated. To enable this up to 50 additional trains will be build in addition to the current 106 1995 stock. The five trains will be required for the proposed Northern line extension and 45 to increase frequencies on the rest of the line. This combined with the segregation of trains at Camden Town junction will allow 30–36 trains per hour compared to 24 trains per hour currently. Victoria line – The signalling system on the Victoria line has been replaced to increase capacity on the line by around 25%; the line now runs up to 34 trains per hour compared to 27—28 previously. The trains have been replaced with 47 new higher-capacity 2009-stock trains. The peak frequency is set to increase further to 36 trains per hour in 2016 after track works at Walthamstow Central: at present only 24 trains per hour can be run beyond Seven Sisters station due to the layout of the points at Walthamstow Central crossover, which transfers northbound trains to the southbound line for their return journey. Renewal of the crossover is essential to achieve 36 trains per hour. This will result in a 40% increase in capacity between Seven Sisters and Walthamstow Central. It is planned that the Northern line be extended to Battersea with an intermediate station at Nine Elms. In December 2012, the Treasury confirmed that it will provide a guarantee that allows the Greater London Authority to borrow up to £1 billion from the Public Works Loan Board, at a preferential rate, to finance the construction of the line. In April 2013, Transport for London applied for the legal powers of a Transport and Works Act Order to proceed with the extension, with a decision expected in the summer of 2013. The stations could open in 2020. The Croxley Rail Link involves re-routing the Metropolitan line's Watford branch from the current terminus at Watford over part of the disused Croxley Green branch line to Watford Junction with stations at Cassiobridge, Watford Vicarage Road and Watford High Street (which is currently only a part of London Overground). Funding was agreed in December 2011, and the final approval for the extension was given on 24 July 2013. Construction work was expected to start in early 2015 and to be completed in 2018. Crossrail is under construction and expected to open in 2018, providing a new underground route across central London integrated with, but not part of the London Underground system. The part of National Rail which will become part of Crossrail, and which has already been completed, is currently running under the name "TfL Rail". Two options are being considered for the route of Crossrail 2 on a north-south alignment across London, with hopes that it could be open by 2033. In summer 2012 London Underground, in partnership with Virgin Media, tried out Wi-Fi hot spots in many stations, but not in the tunnels, that allowed passengers free internet access. The free trial proved successful and was extended to the end of 2012 whereupon it switched to a service freely available to subscribers to Virgin Media and others, or as a paid-for service. Even without subscribing to paid-for Wi-Fi services, the free signals can be used by smartphones to alert a traveller that they have arrived at a specific station. It is not currently possible to use mobile phones underground using native 2G, 3G or 4G networks, and a project to extend coverage before the 2012 Olympics was abandoned due to commercial and technical difficulties. UK subscribers to the O2 or Three mobile networks can use the Tu Go or InTouch apps respectively to route their voice calls and texts messages via the Virgin Media Wifi network at 138 London Transport stations. The EE network also has recently released a WiFi calling feature available on the iPhone. 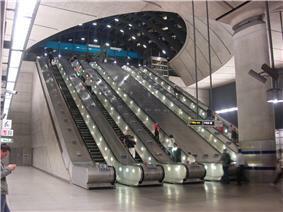 There are 426 escalators on the London Underground system and the longest, at 60 metres (200 ft), is at Angel. The shortest, at Stratford, gives a vertical rise of 4.1 metres (13 ft). There are 164 lifts, and numbers have increased in recent years due to a programme to increase accessibility. 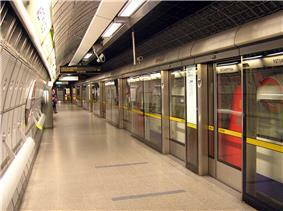 Originally access to the deep-tube platforms was by a lift. Each lift was staffed, and at some quiet stations in the 1920s the ticket office was moved into the lift, or it was arranged that the lift could be controlled from the ticket office. The first escalator on the London Underground was installed in 1911 between the District and Piccadilly platforms at Earl's Court and from the following year new deep-level stations were provided with escalators instead of lifts. The escalators had a diagonal shunt at the top landing. In 1921 a recorded voice instructed passengers to stand on the right and signs followed in World War II. Travellers were asked to stand on the right so that anyone wishing to overtake them would have a clear passage on the left side of the escalator. The first 'comb' type escalator was installed in 1924 at Clapham Common. In the 1920s and 1930s many lifts were replaced by escalators. After the fatal 1987 King's Cross fire, all wooden escalators were replaced with metal ones and the mechanisms are regularly degreased to lower the potential for fires. In October 2015, TfL installed the first incline lift on the UK transport network, at Greenford station. In June 2006 a groundwater cooling system was installed at Victoria station. In 2012, air-cooling units were installed on platforms at Green Park station using cool deep groundwater and at Oxford Circus using chiller units at the top of an adjacent building. New air-conditioned trains are being introduced on the sub-surface lines, but space is limited on tube trains for air-conditioning units and these would heat the tunnels even more. The Deep Tube Programme, investigating replacing the trains for the Bakerloo and Piccadilly lines, is looking for trains with better energy conservation and regenerative braking, on which it might be possible to install a form of air-conditioning. 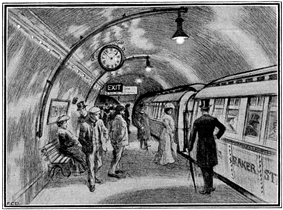 When the Bakerloo line opened in 1906 it was advertised with a maximum temperature of 16 °C (60 °F), but over time the tube tunnels have warmed up. In 1938 approval was given for a ventilation improvement programme, and a refrigerating unit was installed in a lift shaft at Tottenham Court Road. Temperatures of 47 °C (117 °F) were reported in the 2006 European heat wave. It was claimed in 2002 that, if animals were being transported, temperatures on the Tube would break European Commission animal welfare laws. A 2000 study reported that air quality was seventy-three times worse than at street level, with a passenger breathing the same mass of particulates during a twenty-minute journey on the Northern line as smoking a cigarette. The main purpose of the London Underground's ventilation fans is to extract hot air from the tunnels, and fans across the network are being refurbished, although complaints of noise from local residents preclude their use at full power at night. Bakerloo line: Between Queen's Park and Harrow & Wealdstone this runs largely parallel to the London & North Western Railway (LNWR) main line that opened in 1837. The Bakerloo line route has always been segregated, and was laid out by the LNWR in 1912–15. Central line: The line from just north of White City to Ealing Broadway was built in 1917 by the Great Western Railway (GWR) and passenger service introduced by the Underground in 1920. North Acton to West Ruislip was built by GWR on behalf of the Underground in 1947–8 as parallel line to the pre-existing tracks from Old Oak Common junction towards High Wycombe and beyond, which date from 1904. As of May 2013, the original Old Oak Common junction to South Ruislip route sees one main-line train a day to/from Paddington. District line: South of Kensington Olympia short sections of the 1862 West London Railway (WLR) and its 1863 West London Extension Railway (WLER) were used when District extended from Earl's Court in 1872. The District had its own bay platform at Olympia built in 1958 along with track on the bed of the 1862/3 WLR/WLER northbound. Southbound WLR/WLER became the new northbound main line at this time, and a new southbound main-line track was built through site of former goods yard. The 1872 junction closed in 1958, while a further connection to the WLR just south of Olympia closed in 1992, and the branch is now segregated. District line: The westbound track between east of Ravenscourt Park and Turnham Green and Turnham Green to Gunnersbury follows the alignment of a railway built by the London & South Western Railway (LSWR) in 1869. Eastbound track between Turnham Green and east of Ravenscourt Park follows the alignment built in 1911; this was closed 1916 before being re-used when the Piccadilly line was extended in 1932. District line: The line between East Putney and Wimbledon was built by the LSWR in 1889. The last regular main-line service ran in 1941 but it still sees a few Waterloo services at the start and end of the daily timetable. 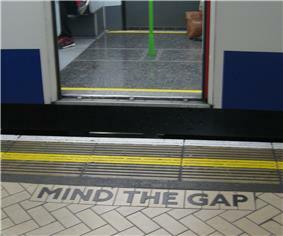 Hammersmith & City: Between Paddington and Westbourne Park tube station, the line is parallel to the main line. The Great Western main line opened in 1838, serving a temporary terminus the other side of Bishop's Road and when the current Paddington station opened in 1854, the line passed to the south of the old station. On opening in 1864 the Hammersmith & City ran via the main line to a junction at Westbourne Park, until 1867 when two tracks opened to the south of the main line, with a crossing near Westbourne Bridge, Paddington. The current two tracks to the north of the main line and the subway east of Westbourne Park opened in 1878. The H & C route is now completely segregated from the main line. Jubilee line: The rail route Between Canning Town and Stratford was built by the GER in 1846 with passenger services starting in 1847. The original alignment was quadrupled "in stages between 1860 and 1892" for freight services before the extra (western) tracks were lifted as traffic declined during the 20th century, and were re-laid for Jubilee line services that started in 1999. The current Docklands Light Railway (ex-North London Line) uses the original eastern alignment and the Jubilee uses the western alignment. Piccadilly line: westbound track between east of Ravenscourt Park and Turnham Green built by LSWR in 1869, originally used for eastbound main-line and District services, eastbound track built in 1911 and closed 1916 and re-used when the Piccadilly line was extended in 1932. ^ a b Passenger figures for both Circle and Hammersmith & City lines combined. The Avg. trips per mile figure has been calculated using a combined route length of 24.3 miles. London Underground's eleven lines total 402 kilometres (250 mi) in length, making it the third longest metro system in the world. These are made up of the sub-surface network and the deep-tube lines. The Circle, District, Hammersmith & City, and Metropolitan lines form the sub-surface network, with railway tunnels just below the surface and of a similar size to those on British main lines. The Hammersmith & City and Circle lines share stations and most of their track with each other, as well as with the Metropolitan and District lines. The Bakerloo, Central, Jubilee, Northern, Piccadilly, Victoria and Waterloo & City lines are deep-level tubes, with smaller trains that run in two circular tunnels (tubes) with a diameter about 11 feet 8 inches (3.56 m). These lines have the exclusive use of a pair of tracks, except for the Piccadilly line, which shares track with the District line between Acton Town and Hanger Lane Junction and with the Metropolitan line between Rayners Lane and Uxbridge, and the Bakerloo line, which shares track with London Overground services north of Queen's Park. Fifty-five per cent of the system runs on the surface, and there are 20 miles (32 km) of cut-and-cover tunnel and 93 miles (150 km) of tube tunnel. Many of the central London underground stations on deep-level tube lines are higher than the running lines to assist deceleration when arriving and acceleration when departing. 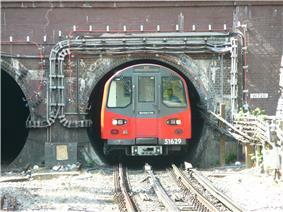 Trains generally run on the left-hand track, although in some places the tunnels are above each other, for example the Central line east of St Paul's station, or the running tunnels are on the right, for example on the Victoria line between Warren Street and King's Cross St. Pancras to allow cross-platform interchange with the Northern line between northbound and southbound trains at Euston. The Underground serves 270 stations. Fourteen Underground stations are outside Greater London, of which five (Amersham, Chalfont & Latimer, Chesham, and Chorleywood on the Metropolitan line, and Epping on the Central line), are beyond the M25 London Orbital motorway. Of the 32 London boroughs, six (Bexley, Bromley, Croydon, Kingston, Lewisham and Sutton) are not served by the Underground network, while Hackney has Old Street and Manor House only just inside its boundaries. Electronic ticketing in the form of the contact-less Oyster card was introduced in 2003. London Underground services on the East London line ceased in 2007 so that it could be extended and converted to London Overground operation, and in December 2009 the Circle line changed from serving a closed loop around the centre of London to a spiral also serving Hammersmith. From September 2014, commuters have been able to use contactless cards on the Tube, the use of which has grown very quickly and now over a million contactless transactions are made on the Underground every day. TfL eventually replaced Public-Private Partnership where private infrastructure companies (infracos) upgraded and maintained the railway. This was undertaken before control passed to TfL, who were opposed to the arrangement. One infraco went into administration in 2007 and TfL took over the responsibilities, TfL taking over the other in 2010. On Friday 28 February 1975, a southbound train on the resulting tube crash, 43 people died and a further 74 were injured, this being the greatest loss of life during peacetime on the London Underground. In 1976 the Northern City Line was taken over by British Rail and linked up with the main line railway at Finsbury Park, a transfer that had already been planned prior to the accident. On 1 January 1948, under the provisions of the British Transport Commission, which was formed on the same day. Under the same act, the country's main line railways were also nationalised, and their reconstruction was given priority over the maintenance of the Underground and most of the unfinished plans of the pre-war New Works Programme were shelved or postponed. 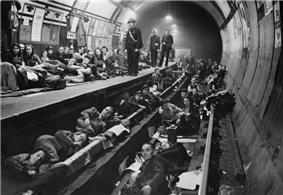 During the war many tube stations were used as air-raid shelters. On 3 March 1943, a test of the air-raid warning sirens, together with the firing of a new type of anti-aircraft rocket, resulting in a crush of people attempting to take shelter in Bethnal Green tube station. A total of 173 people, including 62 children, died, making this both the worst civilian disaster of World War II, and the largest loss of life in a single incident on the London Underground network. In 1933, most of London's underground railways, tramway and bus operators were merged to form the London Passenger Transport Board, which used the London Transport brand. The Waterloo & City Railway, which was by then in the ownership of the main line Southern Railway, remained with its existing owners. In the same year that the London Passenger Transport Board was formed, Harry Beck's diagrammatic tube map appeared for the first time. Yerkes soon had control of the District Railway and established the Underground Electric Railways Company of London (UERL) in 1902 to finance and operate three tube lines, the Baker Street and Waterloo Railway (Bakerloo), the Charing Cross, Euston and Hampstead Railway (Hampstead) and the Great Northern, Piccadilly and Brompton Railway, (Piccadilly), which all opened between 1906 and 1907. When the 'Bakerloo' was so named in July 1906, The Railway Magazine called it an undignified "gutter title". By 1907 the District and Metropolitan Railways had electrified the underground sections of their lines.